Feeling over-worked? So is your skin. 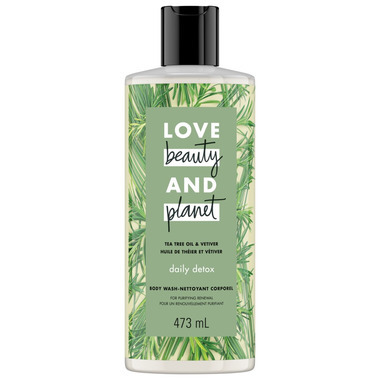 Give it a break with a supremely purifying experience in the shower with Love Beauty and Planet's Daily Detox Body Wash. Infused with Australian tea tree oil, known to detoxify, and vetiver from Haiti, for an earthy refined scent. It’s like a deep sigh for your skin in the shower. With Love Beauty and Planet Daily Detox Body Wash, you can wash the day away, leaving the shower feeling refreshed and purified. This fragrance is infused with a traditionally powerful and stoic scent - vetiver. Its radiant citrus notes mix into a caring blend of precious woods for a refreshing jolt of energy in the shower. Love Beauty and Planet's products are also free of colorants, silicones, and parabens. They do not test on animals and their products are 100% Vegan too.